Entropy and topology are major determinants of the complex dynamics and emergent behaviour of soft matter systems. In particular, the correct description of the release of topological constraints still poses a major challenge in almost any such system. In a series of seminal papers, de Gennes, Edwards and Doi formulated the reptation theory of entangled polymer solutions, which has become a paradigm in the field of soft-matter physics. Not only did the theory introduce new physical concepts, it was also highly successful in explaining many of the unusual properties and collective phenomena exhibited by materials comprised of flexible polymers. Importantly, reptation theory is a mean-field theory, as it essentially replaces the effect of the complicated many-body interaction between the polymer chains by a constraining tube along which polymers move in a snake-like fashion. 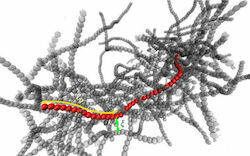 In our work we undertook extensive computer simulations to probe the dynamics of polymers in an entangled solution, with a focus on semiflexible-to-stiff polymers. This covers the range most relevant for important biopolymers like F-actin, microtubules and DNA, as well as for artificial systems, e.g. mixtures of nanotubes. We were excited to discover that our simulations point to completely new dynamics which cannot be explained within the framework of reptation theory. Instead of enforcing snake-like motion along a tube, we find that topological constraints are actually released rather quickly, leading to disentanglement of the polymers and tube reorganisation. To account for this new type of collective dynamics, we have derived a scaling theory that is in good agreement with our simulation data. The processes underlying the restructuring and renewal of the tube clearly involve many-body effects, and appear to show similarities with dynamic correlations found in the glass-like behavior of dense colloidal systems. We believe that our findings may also fundamentally change our current view of collective effects in polymer solutions and soft-matter systems in general. Our theoretical predictions can readily be tested experimentally, either with biopolymer systems or with solutions of carbon nanotubes, as used in a study by N. Fakhri et al. published in Science in 2010 . Note, however, that their work addressed the dynamics of a single semiflexible polymer in an environment consisting of a fixed array of obstacles (porous agarose network), in which the release of topological constraints and many-body effects is precluded. As discussed in our manuscript, our simulations fully confirm the results presented in that experimental study. Importantly, however, our simulations show that the dynamics of a polymer in an entangled solution differs fundamentally from that of a single polymer in a fixed array. This difference further supports our finding that reptation theory breaks down in entangled solutions, as novel relaxation mechanisms dominated by many-body effects become relevant. Our theoretical predictions can readily be tested on solutions of carbon nanotubes or biopolymers. Moreover, in order to test the proposed disentanglement mechanism for terminal relaxation experimentally, one does not need to measure the terminal relaxation time explicitly. It is sufficient to measure the equilibration time of the internal modes and validate the predicted scaling of the equilibration time. This should be feasible well within the time window accessible to experiments on entangled solutions of biopolymers or carbon nanotubes.